Índice del nmero 104 (1-4), 2010. 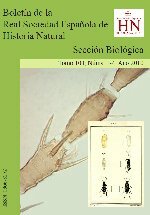 Morphological and Acoustic Characteristics of Phylan (Phylan) foveipennis foveipennis (Mulsant & Rey, 1854) stridulation (Coleoptera, Tenebrionidae). Holotrochus hispanicus sp.nov (Coleoptera, Staphylinidae, Osoriinae) of Valencia, Spain and his curious phenomenon thanatosis.